In the past, mankind could only react to Mother Nature. Today we use science to try and predict Mother Nature. Let’s make a prediction. Let’s forecast the weather and find the perfect spot to spread out our picnic blanket! Pretend the scene in this painting is a park where you go with your friends to have a picnic, relax, play a game of catch or throw a Frisbee. Do the parts of art in this painting come together to create the perfect spot to spread out your picnic blanket? Yes or no? Base your answers on what you see in the painting. Describe the colors. Are the colors bright or dull? Do the colors glow or are they murky and shadowy? What kinds of shapes are there? If you look carefully, you can see two perfectly shaped, oval, white cloud-puffs in a pink and orange and yellow sky. What is above the two cloud-puffs? There is a thick layer of clouds. What other shapes do you see? In the foreground (the space that appears to be immediately in front of us) there are three slightly curved, triangular-shaped trees with thick leaves. In the middle ground there is an empty field and then another line of trees similar to the trees in the foreground. In the background there is a gentle wave of rolling hills and a vast sky. Is there anything unusual about the trees with thick leaves in the foreground? The trees on the right hand side and left hand side are cut in half. Use your imagination. What is on the other side of these trees? More trees? A field? A lake? Art often has positive shapes and negative spaces. Where are the positive shapes and negative spaces in the composition of this painting? The three large trees in the foreground are the positive shapes. The sky around the trees is the negative space. Positive shapes and negative spaces give the painting a sense of scale and perspective. 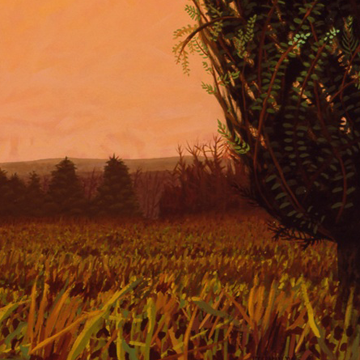 They create depth and make the painted, two-dimensional scene look three-dimensional. Besides positive shapes and negative spaces, what else makes the composition look three-dimensional? 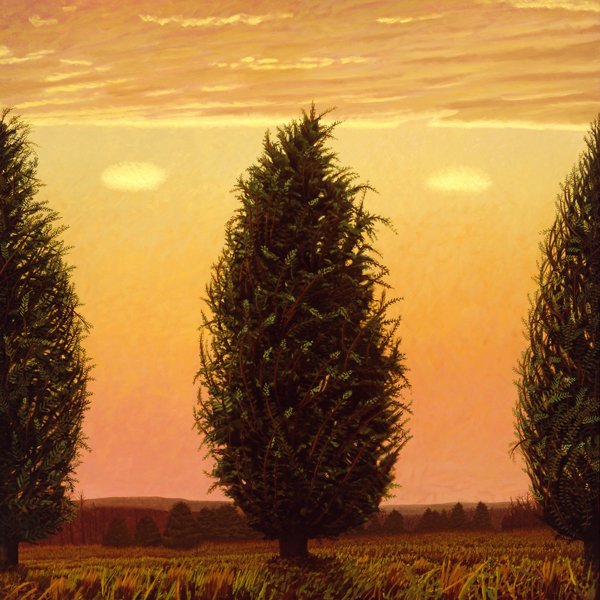 For one, the artist made the trees in the foreground very large, so large in fact they appear to be right in front of us. Then he eliminated much of the middle ground to create a sense of distant space. Finally, he filled his scene with a background of sky and added a thin strip of rolling hills toward the bottom and a thick strip of clouds along the top. All these elements help to create the look of deep space from front-to-back and from bottom-to-top. What about the arrangement of the objects? Are the objects arranged vertically and horizontally? Yes, the trees in the foreground are vertical. They move our eyes from top-to-bottom and bottom-to-top. The line of trees in the middle ground, the hills in the distance, and the upper cloud cover are horizontal. They move our eyes from left-to-right and right-to-left. Imagine a line down the center of the canvas. When both sides of a composition are exactly the same it is symmetrical. Are both sides of the composition exactly the same? No, they are not. But they are nearly the same. Do the almost symmetrical balance, the horizontal and vertical arrangement of objects, and the appearance of deep space from front-to-back and from bottom-to-top create a solid balance? Does this balance give you a sense of vast space? Or perhaps it makes you feel boxed in. What about the two half trees in the foreground on either side? Do they connect you to the scene or do they cut you off? Imagine you have a video camera and are recording this scene. Are you zooming in or out? Are you panning from side-to-side? What is happening? Is the wind blowing? Are the trees bending? Is the sun setting or rising? Are clouds drifting by? Let’s get back to planning our picnic. Should we listen to a weather forecast? We probably should. After all, we don’t want to plan a picnic only to find the day turn out to be cold and wet. Let’s pretend we are weather reporters for a television station. What would our weather forecast be for this scene? What factors must we consider when making a weather forecast? We must consider temperature, wind direction and speed, precipitation, cloud cover and air pressure. More simply put, we must consider the degree to which it is hot or cold, wet or dry, clear or cloudy, calm or windy. Right away we can see it is cloudy. There are two white cloud-puffs and a thick layer of clouds high in the sky. We can also see that it is windy. How so? The branches on the trees in the foreground appear to be blowing in the wind. Look at the top of the large tree in the center. Do you see how it is bending over to the right? What about precipitation? Is a storm on its way? Do the wind and thick cloud cover mean it will rain? Snow? What about the temperature? Does the temperature look hot or cold or pleasantly warm? Base your answers on what you see in the painting. Weather forecasts are not always correct. The chaotic nature of the atmosphere, errors in measurement, and an incomplete understanding of the atmosphere often make it hard to predict the weather. As we all know firsthand, sometimes the weather forecast tells us it will be warm and dry, and it turns out to be cold and wet. Even though weather forecasts are not always correct, they are important. Why? We need to forecast the weather to protect life and property, assist farmers, and help people determine what to wear on any given day. Here in North Carolina it is important to forecast weather systems. Indeed, it is a matter of life-or-death to predict and track the course of hurricanes. What are hurricanes? Hurricanes are storm systems that produce powerful winds, torrential rains, high waves and tornadoes. Clearly, we need to predict weather systems so we can protect life and property. Do you know what the difference is between weather and climate? Weather is the condition of temperature, wind direction and speed, precipitation, cloud cover and air pressure over short periods of time (usually five to seven days). Climate, on the other hand, are these conditions in a given region over long periods of time (usually thirty days or more). In North Carolina, climate depends on geographic region. North Carolina has three geographic regions—the coastal plain, the Piedmont, and the mountains. Compared to the coastal plain, in the Piedmont summers are hotter (daytime highs of 90°F or higher) and winters are colder (daytime temperatures in the 40s and often dropping below freezing at night). Compared to the mountains, summers in the Piedmont are hotter and winters are milder. What is the weather and climate like where you live? Close your eyes for a moment and imagine this scene. What do you see? What do you hear? It may be just me, but I can imagine a pack of dogs happily chasing each other and barking, children racing across the field flying kites and laughing, fathers and mothers chatting, couples walking hand-in-hand, a group looking through binoculars at a flock of birds soaring overhead. Interestingly, often what we “see” in art is more than what the artist put in! What do you think? Is the scene peaceful? Inviting? Hushed? Mysterious? Is this the perfect spot for a picnic or not? Would you like to see Three Trees, Two Clouds in person? All you have to do is visit the North Carolina Museum of Art in Raleigh, North Carolina. Three Trees, Two Clouds is in the American galleries at the museum. Or perhaps you would like a tour. Tours of the collection are given daily, except for Monday when the museum is closed to the public. If you prefer, you can contact the museum ahead of time and arrange for you and your friends to have a private tour. I’m sure a docent at the museum would be happy to show you and your friends Three Trees, Two Clouds and many other works of art. Whether you visit the museum on your own or have a tour with a docent, it will be well worth your time!